Certain links provided on this site will launch Internet sites that are not under the control of Angus Fire. Angus Fire provides these outside links solely as a convenience to its users and the provision of any such link is not an endorsement by Angus Fire of that site or any of the contents, products, or services contained or offered therein. Accordingly, Angus Fire makes no representations or warranties whatsoever concerning availability of or content, including sub-links, found on those sites. By submitting information and material to Angus Fire, whether via e-mail or otherwise, including, but not limited to, feedback, questions, comments, suggestions, ideas, graphics or computer files of any type, you thereby expressly grant, or warrant, that the owner of such material has expressly granted Angus Fire a royalty-free, perpetual, irrevocable, non-exclusive right and license to use, reproduce, modify, adapt, publish, translate and distribute such material (in whole or in part) worldwide and to incorporate it in other works in any form, media or technology now known or hereafter developed, subject to the angusfire.co.uk Statement of User Privacy. 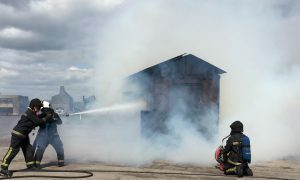 Neither Angus Fire nor any of its subsidiaries, employees, or other representatives shall be liable for damages arising out of or in connection with the use of this site. Under no circumstances shall Angus Fire have any liability for any consequential, incidental, indirect, special, or punitive damages or costs, including, but not limited to, lost profits, business interruption, loss of information or data, or loss of goodwill, loss of or damage to property, and any claims of third parties, arising out of or in connection with the use, copying, or display of this site or its contents or any linked Web site, regardless of whether Angus Fire has been advised, knew, or should have known of the possibility thereof. This site is maintained and controlled by Angus Fire in the United Kingdom. Angus Fire makes no representation that materials on this site are appropriate or available for use at other locations outside of the United Kingdom and access to this site from territories where this site’s contents are illegal is prohibited. If you access this site from locations outside the United Kingdom, you are responsible for compliance with all local laws. The laws of the United Kingdom shall govern the content and use of this site, without giving effect to any of the conflict of law principles or rules thereof. All Web site design, text, graphics, and the selection and arrangement thereof, are the property of Angus Fire and are copyright © 2016 Angus Fire. All rights reserved.